The Titan II GLV (Gemini Launch Vehicle) or Gemini-Titan II was an American expendable launch system derived from the Titan II missile, which was used to launch twelve Gemini missions for NASA between 1964 and 1966. Two unmanned launches followed by ten manned ones were conducted from Launch Complex 19 at the Cape Canaveral Air Force Station, starting with Gemini 1 on April 8, 1964. The Titan II was a two-stage liquid-fuel rocket, using a hypergolic propellant combination of Aerozine 50 fuel and nitrogen tetroxide oxidizer. The first stage was powered by an LR87 engine (with two combustion chambers and nozzles, fed by a single set of turbomachinery), and the second stage was propelled by an LR-91 engine. In addition to greater payload capability, the Titan II promised greater reliability than the Atlas LV-3B, which had been selected for Project Mercury, because Titan's hypergolic-fueled engines contained far fewer components. A "Gemini Malfunction Detection System" was installed to inform the crew of the rocket's status, and improve response in an emergency. Redundant systems were installed to reduce the chances of launch failures. To help guard against the possibility of a guidance malfunction causing the engine nozzles to gimbal hard right or left, an extra backup guidance system was added. The second stage propellant tanks were lengthened for longer burn time and unnecessary vernier engines and retrorockets were removed. Because the second stage engine had had issues with combustion instability, it was equipped with baffled injectors. The first stage was loaded with 13,000 pounds (5896 kilograms) more propellant than the Titan ICBM although the storage tank size remained unchanged. Modifications were made to the tracking, electrical and hydraulics systems in the interest of improved reliability. The propellants were chilled to slightly improve vehicle performance. This allowed for more mass to be accommodated. First stage engine thrust was reduced slightly to cut down on vibration and G loads. 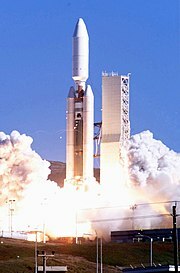 First stage engine burn would go until propellant depletion unlike Titan ICBMs which were designed to cut off when propellant flow/pressure and engine thrust started dropping as the tanks emptied. This was to prevent the possibility of a malfunctioning pressure sensor triggering an abort condition. Also, running until depletion would slightly boost the Titan's capacity for payload. Modifications were overseen by the Air Force Systems Command. The Aerojet company, the manufacturer of the Titan's engines, had released a revised model during mid-1963 due to deficiencies in the original design, and also to attempt to improve manufacturing procedures. Film footage of Gemini 10's launch revealed that the first stage oxidizer tank ruptured shortly after staging and released a cloud of N2O4. As first stage telemetry had been terminated at staging, there was no data other than photographic/visual evidence to go by, however the conclusion was that either loose debris struck the oxidizer tank dome or else exhaust from the second stage engine had burned through it. Gemini 12's launch vehicle also experienced a tank rupture after staging and film review of Titan II ICBM launches found several occurrences of this phenomenon. Since this did not appear to pose any safety risks to the astronauts, NASA decided that it was not a concern. During Titan II ICBM development, it had been found that the first stage turbopump gearbox was prone to total failure caused by resonant vibration in the idler gear. This problem had not occurred on actual launches, but only static firing tests. This was considered to be a critical item to fix. Aerojet developed a totally redesigned gearbox, and all of Gemini launch vehicles except for the unmanned Gemini 1 used it. There was also a potentially serious problem with the turbopump bearings which led to more design changes, however the odds of failing on a Gemini launch were slim to nil since GLV boosters used specially selected and tested bearings, in addition the turbopumps would be "hot fired" as part of prelaunch checks. Combustion instability in the second stage engine was also a concern although that too had only been witnessed in static firing runs. A new injector with improved baffling was developed for the engine and flight-tested on a Titan IIIC launch; all GLVs from Gemini 8 onwards incorporated it. After a Titan II propellant feed line was found to have some damage during factory inspections, NASA put out the requirement that all GLV propellant lines had to be X-rayed in order to prevent a potentially disastrous fuel leak during launch. X-ray tests later found several more damaged propellant lines, most likely due to careless handling. The most significant issue in man-rating the Titan II was resolving problems with resonant vibration known as "pogo" (since the action was said to resemble that of a pogo stick) that could produce g-forces sufficient to incapacitate astronauts, but the Air Force were not interested in helping NASA with a problem that did not affect the ICBM program and could potentially delay it, or require major modifications to the design. However, Martin-Marietta argued that the pogo problem could be fixed fairly easily, and also the Air Force began to develop more of an interest in man-rating the Titan II due to the proposed Manned Orbiting Laboratory program. The primary changes made to resolve pogo were adding oxidizer standpipes, increasing the pressure in the propellant tanks, and adding a mechanical accumulator to the fuel suction side. Another nuisance problem that occurred during the Gemini program was code-named "Green Man" and involved momentary pitch oscillations of the Titan second stage following engine cutoff. This phenomenon had happened on both Gemini and unmanned Titan II/III flights and had resulted in the failure of the ablative skirt on the second stage at least twice (those instances were dubbed "Brown Man"). Investigation following skirt failure on a Titan IIIC launch concluded that pressure buildup in the ablative skirt caused the pitch oscillations, but NASA decided that there was probably little chance of loose debris from the skirt contacting the Gemini spacecraft, so no corrective action had to be taken and in any case, the Titan IIIC incident was found to be the result of poor quality control which would not affect the more tightly supervised Gemini program. The Titan II had a much higher thrust-to-weight ratio than the Saturn V. Astronauts experienced almost 6G before the second stage stopped firing at 100 miles (160 km) altitude. Richard F. Gordon Jr. compared the Titan II to "a young fighter pilot's ride. It's faster than the Saturn's old man's ride." Frank Borman said that simulations did not prepare him for the "almost deafening" noise, which he compared to a jet's afterburner or large train. Walter Schirra and Gordon Cooper reported that the ride was smoother than on the Atlas, however. ^ "New Image - ONLY - Scan to PDF" (PDF). Retrieved 2018-10-13. Krebs, Gunter. "Titan-2-GLV". Gunter's Space Page. Retrieved 2009-04-29. Wade, Mark. "Titan". Encyclopedia Astronautica. Retrieved 2009-04-29.